After seeing the large potted hydrangeas in the garden at the George Eastman House, I decided to try it myself. In Zone 4, the natural choice for my pots was the Endless Summer variety. These bloom on both old and new wood, assuring that I will have blooms each year even though the buds on the old wood will never make it through our cold winter tempertures. 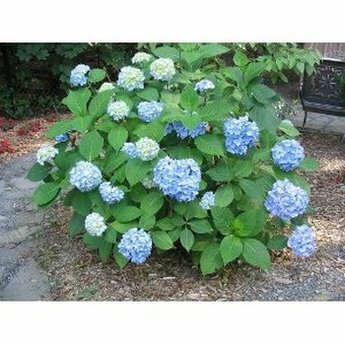 I put two Endless Summer hydrangeas into two large blue pots. I grew them outside, and then brought them into my garage in November. I watered them once a month, and brought them into the house at the beginning of February (Ground Hog Day.) I put them in front of my south-facing patio door, and watered them regularly with my husband's left-over coffee to increase their acidity. By March, I had beautiful blooming plants with large healthy leaves and large blue blooms. They were perfect! However, be careful about easing them outside. They didn't like being in full sun after being indoors, so I had put them in a partially shady location.